Whether you smoke in your car regularly or you have a friend who smokes and you don’t mind it, you’ve got a problem. Choosing to smoke is part of the freedom we all enjoy. It’s your vehicle that will take the brunt of what happens next. The cigarette smoke, which contains various chemical particles, leaves a thin coat of residue behind on your upholstery, floors, dashboard, and trim. Over time, that residue traps odor particles from the smoke. Without a thorough cleaning and tools to help you get the smoke smell out of your car, it will begin to smell like an ashtray. And no one wants to commute in an ashtray. These are the best products to help you remove smoke smell from your car, truck or another vehicle. That way you won’t need to stick your head out the window as you drive just to breathe. What Are the Best Products to Remove Smoke Smell? There are several methods that can help you to improve the odor of your vehicle, but only a handful of products will permanently remove that smoke smell. You need something that goes beyond a masking agent. You need these top-rated products. Did you know that it is illegal in some parts of the world to smoke in your car when children are riding with you? Even where it is not illegal to do so, some may say that driving with you feels like a crime. When an auto reeks of stale cigarette smoke stench, it can be a burdensome experience. You may be nose-blind to the issue, but your friends or family may certainly notice your driving habit. If you want to know how to remove the smoke smell from your car, then you must identify where the source of the smoke smell lies. Because smoke can be circulated throughout your vehicle’s venting system, you may find that a full detail won’t make much of a difference. You will never notice an improvement if you keep the ashes or butts from the cigarettes in your vehicle as you’re trying to remove the smell. There isn’t an air freshener in this world that is powerful enough to permanently mask those odors. So, if you’re trying to get a fresher odor in your car, you’re going to want to follow these specific steps first. Clean out all your ashtrays. Clean your cup holders. Vacuum your floor, paying close attention to the areas around your seat, where the ashtrays are, or where your friends tend to smoke when riding with you. Replace your cabin air filter. This filter traps smoky smells within it as it filters the exterior air. You may find the filter in the glove compartment, under your dashboard, or even near your engine, under the hood. Shampoo your upholstery and floor. You will need to wipe down all surfaces because the smoke will have settled onto all of them. As part of the shampooing process, you’ll need to brush out the carpet and seating. If you have leather seating, use a leather cleaner and conditioner that is rated for the type of leather that is in your vehicle. Clean your door panels and air conditioning vents. If you can take these actions on your own, then you can save some cash. The average cost of a thorough interior cleaning by a professional to remove the smoke smell from your car could top $200. For larger vehicles, the cost could be even greater. Once you’ve thoroughly cleaned the vehicle, then you’re ready to take on the next challenge. Because cigarette smoke creates thin layers over your vehicle’s interior, it may take more than one thorough cleaning to remove the lingering residue. 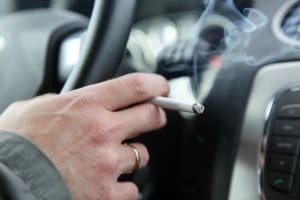 In cases where heavy smoking occurs in a vehicle’s interior, such as a pack per day, the smoke odors can actually penetrate upholstery fibers, the pores of leather surfaces, or find weak areas of fiberglass, plastic, wood, and other materials that may be present. You may have cleaned the entire surface, but because the odor particles have fused with the materials, there will still be a stale aroma of smoke that remains. If these particles are near the surface, 2-4 additional thorough cleaning efforts may be able to remove the bothersome musk. In many cases, however, it will not. That is when it is time to take steps that are a little more drastic to remove that bothersome odor. Here’s what you can do. Use an odor absorber. Activated charcoal is specifically effective at absorbing odors. You can also leave a box of baking soda in your vehicle or cover your upholstery and floor with the baking soda by sprinkling a heavy layer on it. You’ll need to change out the baking soda every 24 hours for best results. Use dryer sheets. Dryer sheets can help to absorb difficult odors that don’t want to go away as well. You’ll need about 1 dryer sheet for every 25 square inches of space placed within your vehicle. Change out the dryer sheets every 48 hours. Use kitty litter. If you place cat litter into a container in your vehicle and leave it open while you aren’t driving, the activated carbon in the materials will work to remove the smoke whiff as well. If the price of what you use doesn’t matter, then you may wish to consider using odor removing gels or crystals within your vehicle. These products take a little more time to fully eliminate the bothersome odors, but they are also non-toxic and don’t require you to make a mess out of your vehicle. Just place the crystals or gel into a cup holder or some other secure location and the car’s environment will begin improving a little bit every day. What About Using an Ozone Generator or Machine for Smoke Removal? Now you’ve tried everything. Maybe you even paid someone to have your vehicle professionally detailed. Once the perfumes, air fresheners, and other good smelling stuff fade away, your nose detects its presence once again. That stale cigarette smoke odor is still present. One option that is still available to improve the interior of your vehicle is to use an ozone generator or machine. These products are not recommended for consumer use in the United States by the EPA, but the oxidizing effect that ozone creates can interact with the odor particles from the cigarette smoke and remove them. That includes cigarette smoke odors that may be several years old. It is necessary to follow all manufacturer’s instructions for use when using an ozone machine to remove the smoke smell from a car. The benefit of using ozone to remove odors is that the job happens quickly. For most vehicles, running the generator or machine for about 6 hours is what will be required to purge the bothersome odors permanently. If it has been several years since the last time the car was detailed, it may take up to 24 hours. Once you’ve finished the ozone treatment, it is necessary to fully vent your vehicle before using it. Driving with the windows open does not count as venting. Ozone is a lung irritant and long exposure can cause lung tissues to become inflamed. That inflammation can lead to scarring and future health concerns. How Much Do Smoke Removal Products Cost? The price of your cigarette smoke odor removal product will depend on what method you ultimately choose to improve the environment of your vehicle. Ozone machines tend to be the most expensive method to use. A new generator or machine will be priced between $150-$300 in most instances. Smaller models can be found for less than $100 but will take more time to eliminate the odor. Air purifiers are another option, often priced below $100, but since most vehicles today already filter the air, you’re creating a redundant system that may not be effective. Shampoos, deodorizers, odor eliminators, and chemical applications tend to be the cheapest method to remove cigarette smoke odors. Most products are priced below $30, though brands like Fresh Wave may have their items priced higher. If you continue to smoke in your car, keep in mind that these costs will continue to add up with each detailing or cleaning effort. For that reason, smokers may wish to invest in an ozone machine or similar product that can be used multiple times to save money. It takes just 3 self-cleaning efforts to pay for an ozone machine or 1 professional detailing. One of the most effective ways to eliminate a foul stink is to use a chlorine-based substance. It’s the reason why pools can be safe, even if they need to be “shocked.” The same can happen for your vehicle. This product will clean out the odors from your interior and will clean out your ventilation system at the same time. Add water to the product and set it in your vehicle for at least 2 hours. For stale, strong odors, use it for 24 hours and you’ll have an effective way to bring back the new car smell once again. We loved this removal product for vehicles because you can just throw it into the car and leave it there. It’s non-toxic, made from a blend of minerals, so you can literally use it anywhere. You’ll notice it begin to work after about an hour in your vehicle and the smoke odors generally begin to fade within a day. For severe odors, we recommend using two bags instead of one. Throw one in your trunk and keep one by your seat and you won’t mind smoking in your auto. Maybe you’re a smoker, but your job requires you to hang out or sit next to nonsmokers every day. Instead of dealing with their complaints about your smoke odors, consider this personal air filter instead. It will remove odor, vapors, and smoke amazingly well. Just exhale through this filter and odorless air comes out the other end. It’s one of the best ways to control second-hand smoke or the problems with third-hand smoke exposure. Take a look at the price and grab one for the car and at home too. This natural car air freshener uses bamboo activated charcoal instead of standard wood products. The end result is an unscented deodorizer bag that removes odors, allergens, and even moisture from your vehicle. For those who live in areas that are most, such as the US Pacific Northwest, this product can help to prevent or control mildew and mold growth that can happen. Each pack covers about 200 cubic feet and an aluminum carabiner lets you anchor the product to virtually any point in your car. Its effectiveness will surprise you. This air freshener absorbs those nasty smoke odors quickly and effectively. Install it behind your seat and you’ll receive up to 1 full year of odor-absorbing benefits with just one unit. Add a second if you smoke regularly in your vehicle to help maintain a better level of freshness. It is a passive design, is allergen-free, and made from sustainable products. If you’re looking for a no-nonsense solution to remove odors from your car, you’ll want to give this product a good look today. Are you a cigar smoker? The worst part about smoking cigars in a car is that the odor permeates into everything. Cigars smell fantastic before they’re burned, but not so much in the aftermath of enjoying them. With this ozone car air purifier, which operates from the 12v connection in your vehicle, you’ll have a way to apply a controlled dose of ozone to remove those stubborn cigar odors and other smoke smells. It is approved by the FCC, ROHS, EMC, and CE and constructed with ABS materials. Put it in front of your air vent and let it get to work. You’ll find those tough odors don’t stand a chance. This unique little ionic air purifier runs on the USB connection that most new vehicles have today. Just plug it in while you’re driving and you’re ready to go. You can also run it off 4 AA alkaline or rechargeable batteries if you prefer. You can also turn it off while you’re driving if the odor from the ionized air is bothersome. It doesn’t need a replacement filter or plate. We were pleasantly surprised by how effective this unit operates and would highly recommend it to anyone struggling with smoke odors in their vehicle. This option for a car air purifier plugs directly into your 12v outlet. It releases 4.8 million negative ions as it operates to eliminate strong odors, whether you smoke cigarettes, use e-cigarettes, or vape. It will quickly improve air quality by removing other small particles, such as pollen, while it is working. If you don’t agree with us about the effectiveness of this product, then the manufacturer offers a spot-on 100% refund. That means there’s virtually nothing left to lose except the foul smoke smells coming from your car. We liked this little air purifier for smaller vehicles. It operates just like most other 12v models do, though the design is more compact so there are fewer bumps that happen while driving to dislodge it. It comes with an 180-day replacement warranty and a 30-day money back guarantee. The blue light is attractive enough, but the real measurement is in how it can eliminate odors. For a larger vehicle, it struggles to reach the back. For a sedan, coupe, or hatchback, however, we found this to be an extremely effective product. This deodorizer bag is a fast and convenient way to begin controlling the smoke smells coming from your vehicle. It is free of both chemicals and fragrance, so you don’t need to worry about strange odors from the product replacing those smoke smells. You can reuse this product for up to 2 years. Just leave it out in the sun for about an hour, once per month, and it will keep removing smoke odors for you. It also does an excellent job of eliminating excess moisture from your vehicle’s interior. We found it to be an effortless way to improve the indoor environment of any vehicle. The best products to remove smoke smells from a car or other vehicle work quickly, stay affordable, and perform consistently. If you’re tired of your car smelling like an ashtray (or hearing complaints from your family or friends about how your car smells), then grab one of these products today. You’ll be glad you did.